…Your rate is locked at 4.125% for 15 years. The appraiser will be calling you to arrange a time to view your home. I am no allowed to discuss your property with the appraiser but YOU can push him/her for a number. I’d like to see at least $88,000 for a value. You can push for that number so sell your house well!! This is why appraisers exist: to provide an unbiased and honest opinion of value of a property. Where are the ethics and laws to protect the consumer from these types of lenders? Today’s lenders want fast and cheap and will do anything they can to close a loan. They will use desktops, appraisal waivers (which the consumer should never agree to without an independent appraisal as well), AVMs, and yes, they will do exactly what this person did in the example above. Is the consumer protected? Does the consumer’s confidence in the integrity of the loan process improve because the loan officer is asking them to press the appraiser for a value? My answer is NO. Yes you want that loan but at what cost? Great article Mark! Have you filed a complaint against the LO? $350 for an appraisal, I was making that 10 years ago. I love my clients even more now. One of the engagement letters state this. “Please contact XXXXXXX Home Loans Chief Appraiser if anyone with an interest in the real estate transaction or property attempts to improperly influence the reporting, result or review of real estate appraisal.” The LO in the above letter proves what is wrong with the lending side of things. How stupid can a person be to put that on paper. I never understand this. I tell both the sellers and buyers to push me. I ask them why, what do they see? I want all the information possible on my appraisal report. Show me all your upgrades, even if it is two screws on a gutter. I am smart enough to look at comps provided to me and decide if they are similar, superior, or inferior. Now if the lender is saying make this value or I will pull the work, OK. Clearly NO. But to tell me you think something is worth $1 kabillion, great, why do you think that? I put in a gold lined basement. Comps 1 and 2 just sold, great I will look at them. You think it is worth that because you just think so, great, I will take that into account, too. Comps tell the story. I look at everything factual and come up with a value. I would expect no less from a buyer or seller to make their case. Heck, a lender can even make their case. I don’t care. Give me facts and I am happy to compare. Give me opinion or threats, well that gets you nowhere because it is not a market fact. Buyers and sellers are the market, not me. Ultimately though, it is my due diligence to get ALL facts (comps). It is my license on the line, my work product, my research, and my final decision and I want no less that all the facts I can get my hands on. The homeowner telling you all they did to the house, the upgrades, the things they want you to know is great. I expect that all the time and always ask them questions. So yes they are selling their home to you to inform you of the details that may be required for you to generate a good report. The owners most always think their home is worth more. That’s all fine if they are doing it without any influence or instructions from the LO to hit a number. But the loan officer Instructing them to PUSH for a number and then stating what they want value wise since they can’t speak to the appraiser Is clearly wrong and not in the best interest of the Consumer. Telling them to PUSH for a number so sell your house well is completely off the wall. You don’t think there is anything wrong with that? 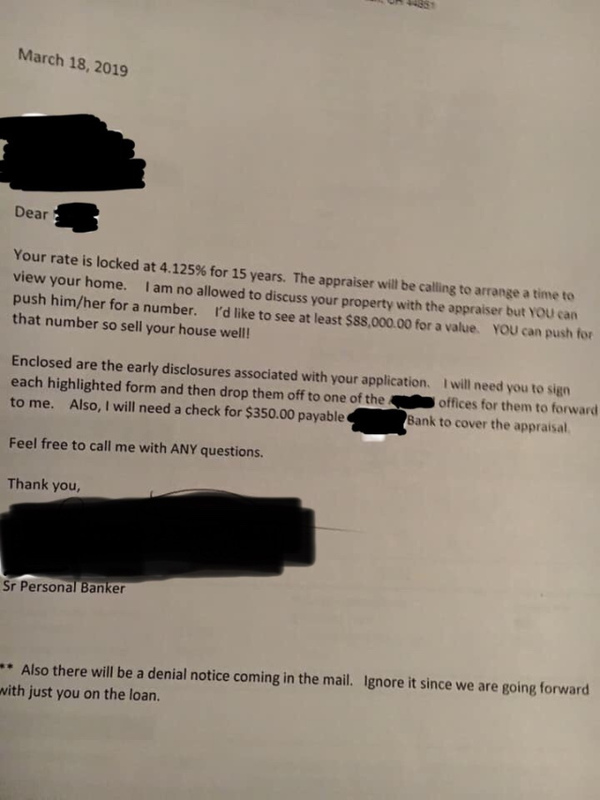 Jon Anweiler the point is the loan officer has violated appraiser independence as per Dodd frank and is instructing the owner to push to obtain value as stated in the letter. They have clearly stated what to do since they cannot. I can’t see how this is acceptable. I suppose. I just do not see how it is pushing when I am free to say the word “NO”. Mark, “Jon, give me $100 now”. Jon, “no”. No problem. Mark, “give me $100 now or I will stop giving you $1000 in business per month.” Now that would be a violation. To constitute a violation, there needs to be a threat to the appraiser. Am I wrong here? Respectfully Jon, yes you are wrong. Direction, instruction and or inducement are all wrong and each is a synonym for “push” the value in the LOs direction to the owner. Agree we can and DO still say no, but the point is lenders routinely violate DF. This is a more mild violation…just like direction to file false complaints against appraisers when we say “no”. Not direct retaliation…but just as intimidating to others. Hey Jon. Thanks for showing up on the blogs dude, I think you have some very interesting insight. The ‘direction’ towards the appraiser is inherently built in. We do after all, always have access to some database which actually has, like, numbers and stuff which indicate the direction of price and value and consumer trends. Shoot, I could still pull off a valid appraisal even if working with only the comps provided by a lender. I would however, most likely not be able to provide the requested underwriting bracketing. LOL! This is confusing by design. There is a very important reason the industry went with separation from loan production over forced round robin or clearinghouse as suggested by the IVPI proposal… It’s because the lenders wrote the damned rules. Aka; regulatory capture. Yes Jon you are wrong. Jon Anweiler Apparently you didn’t read the article. It wasn’t about a threat to the appraiser. Once again ill explain it. It’s about the undue influence and direct violations of Dodd Frank that the loan officer presented in his words to the homeowner to push the appraiser for a value because he cant. I cant explain it any further with you as its apparent you are just out to flex like you do all the time in your comments. Thanks for the comments however you are missing the pop one that others clearly see. OK, I read the article, but I did not see the threat to the appraiser in it. There was a vague reference that the appraiser might not get paid, but that was not clear. OK, flexing over. Jon Anweiler ha. It’s all good. I made reference in the beginning to other blog posts I made in the past about the pressures and more appraisers face. However this article was about something different. Thanks. It’s all good. Jon Anweiler I’m with you Jon, I always tell them to tell me everything they know about their home. Even if they think it doesn’t matter. The more I know, the better job I can do. I would rather know too much than not enough. Tamra L. Cape that’s not the point of the article. Yes we all want to know everything we can. However red the article. The loan officer is telling them to push the appraiser for a number because they can’t. A homeowner telling you things about the house is way different than a loan officer trying to influence the value of the report through the homeowner. Thank you Mike. I appreciate this a lot. Mark, another great article. Thanks dude. Jon Anweiler, it is not that hard to understand. If the lender tells the borrower in writing to influence the appraiser on the value. The lender is in violation of Dodd Frank. It is not about you it is about them. I have people giving me #s all the time, I do not care what they think. I let the comps and my report do the talking for me. For a lender to do a work around with Dodd Frank is a different issue. This is why I never discuss #s, the brokers and owners can push #s all day long, I do not care, I just do my thing and let them talk. I want them to tell me about the property, I do not want them to tell me what it should appraise for, just to make the deal work. Understand now? But if you never talk numbers, how do you get an appraisal report done? You must at least think about and report on them. This is confusing by design. It’s not that complicated, when I am talking to the owner or the broker (if they even show up), I never say “I think your property will appraise for …….” The numbers are in my report, and the report is completed for the client, which will most likely be the lender. Sure I get it, completely. Sometimes talking numbers is best for everyone though. It’s not advocacy to help them get to the finish line with hypothetical, if coincidentally a health and safety shortcoming may be what’s holding them back. If I could just talk to qualified people directly, we could all work together in an ethical upstanding way to form solutions for the individual challenges at hand, ahead of that point where calamity ensues because deals are not working. There are no easy answers but dang, if only there was rotational distribution, they’d be able to sort it out and would develop more meaningful routine methods and approaches to do so, rather than just saying use the next appraiser forever instead. It is what it is, and we appraisers don’t change that. They’re still selling rainbows, and surprisingly, consumers keep buying that. If one was to ponder institutional memory, consumers are actually much more to blame than lenders. How many times and how many centuries of a similar but slightly different process of money changers burning citizens does it take before people get a clue? Greed I guess… Caveat Emptor. The number is not even the half of it. Jon I also want all the facts, opinions and beliefs of a buyer or borrower…for the reasons you cite. However, federal law puts limits on how that may be communicated, including the amount needed. You and I are not trusted to know the loan amount or LTV because we’d be able to calculate the “amount needed”. We also are assumed to have the same low level of integrity most bankers have. Can’t trust us with that secret knowledge or we will obviously cheat. Except in a sale. There we can be trusted. Except if the value doesn’t meet contract price. Then we aren’t trusted again. Marks outstanding article points to how brazen (& ignorant) lenders have become. These examples didn’t include the usual threats that go along with such directions….and AGA has more than a few written samples of those. Dodd Frank is ignored 100%. From reasonable fees to appraiser independence. The new Chair of the House Financial Services Comm needs to revisit and address this. It’s a clear attempt at an AIR Violation using the borrower as a go between. The icing on the cake would be a follow up finishing effort where the lender then requests the appraiser provide a signed AIR compliance document. Even though the appraiser is incapable of intimidating themselves, with holding work from themselves, all of that. My take on these issues of value expectations is that it would be good if we always talked about the number and ltv’s needed. Then we could provide more effective consultation to both borrowers, brokers, and agents, so everyone could work as a team to accomplish what needs to be accomplished to help move the borrower to the finish line. It’s not advocacy to clearly and accurately describe why the expectations are falling short of the requirements. Cheers. Baggs, that would make too much sense. We now work in an appraisal world where absolutes are expected rather than common sense. For example. IF our (preliminary) concluded value range is $200k to $210K and for whatever inconsequential reason our ‘reconciliation is at $200k vs anywhere else (perhaps no more than rounding), and a SP OR refi 80% LTV requires $201,999 who has been served by this ‘absolute’ conclusion? A less than 1% variance is not statistically determinable in any credible across the board scenario. In a common sense world, the property would be appraised at $202,000; $205,000 or even $210,000. Honest appraisers are not going to bump or reconcile to unsupported numbers. The above scenario is not getting reconciled to $215,000; or any other number out of the credible range. Why should deals be killed and licenses put in jeopardy (state complaints) for these kind of variants? Otoh, if the top of my adjusted range is “X” and the price is “X+1”, then THAT deal is getting killed because I cannot reasonably reconcile outside my own concluded range. Our regulators desire to think absolutes are even possible actually causes more harm to consumers and taxpayers than bad lending policies do. This isn’t really much different that inclusion of verboten pictures in reports. Appraisers don’t even consider religious icons or racial characteristics in a picture. Yet regulators decided we “might”. Therefore an absolute prohibition is decreed. That’s why I look at market data thoroughly, with logic, ‘from the shoes of a buyer’, or sometimes even the seller. Then when I’ve got a good feel and such I often hit at the top of the adjusted value range. If it was my property, believe that, that’s where I would demand that to be and if there is a single buyer out there, that’s what I’m going to get. Under all auspices of strict fairness and above board ethic of course. I just ruined my own argument. Also, rule of thumb. Never take a photo of yourself in the mirror. Instant deal killer. Who’s that guy? Oh no! lol. Jon I also want all the facts, opinons and beliefs of a buyer or borrower…for the reasons you cite. However, federal law puts limits on how that may be communicated, including the amount needed. You and I are not trusted to know the loan amount or LTV because we’d be able to calculate the “amount needed” .We also are assumed to have the same low level of integrity most bankers have. Cant trust us with that secret knowledge or we will obviously cheat. Except if the value doesnt meet contract price. Then we arent trusted again. Marks outstanding article points to how brazen (& ignorant) lenders have become. These examples didnt include the usual threats that go along with such directions….and AGA has more than a few written samples of those. Dodd Frank is ignored 100%. From reasonable fees to appraiser independence. The new Chair of the House F inancial Services Comm needs to revisit and address this. Talking about a numerical figure does not make me susceptible to lender pressure. Comp searching is a thing of the past which is what those rules were intended to squelch. Something about having a duty to not just the lender, but also the public trust. It is however, more proper to have that conversation with the borrower and not the lender. With the borrower we do have authority of license. With the lender we are forced to be subservient to their interests due to lack of fair and evenly balanced order distribution approaches. As long as we’re not getting pushed around, I think we should know all of the details, including being privy to the home inspection reports and buyers ltv. I never did need protection from lender pressure in the first place and a far better action to take instead of separation from loan production would have been a strict round robin assignment system. To date, I don’t think anyone has ever tracked appraisers or individual persons involved with origination by how many defaulted loans they were involved with and issued any publicly available data on that. Although I clearly understand the premise of the article and the points at hand, I’ve always held a begrudging resistance because without adequate data, how can anyone make truly informed decisions about what’s really drawing up default rates and risk? Hell what does the number even matter anyways, we’re not doing cash equivalent analysis based on the rate at the time and the cost of money to one borrower is not the same as the cost of money to the next borrower. It’s just all so complicated and detailed attentive appraisers serve other important functions, it’s not just all about numbers and value. I do strongly agree with the intimidation rules, just not the separation rules. That agent though, he’s breaking the rules so that’s like still very article worthy, the blatant disregard. Remember the story when the appraiser pressure hotline opened up for like 2 days or something then went offline immediately? MB’s were sending every failed deal to the hotline, and appraisers could not even get through. Why should they care, it’s the taxpayers money anyways. Great article Mark. So good to get this kind of bull crap we deal with out to the public. This just in. HUD files discrimination suit against facebook. Redlining with ads if I understand it correctly. Targeted advertising is not only problematic, but downright simply annoying. This is why I still subscribe to paper, you get far less targeted marketing. I’m trying to keep an open mind on this and be prepared to believe it is only bad programming. On the other hand, we’ve known for years that inclusion of census tract racial; age, and socio-economic & marital status data in appraisal reports (under the innocuous census tract number), this was bound to happen. We can’t include a human’s picture or their family photos in any of our property appraisal pictures, but the bank, underwriters, insurers, and investors ALL can determine racial composition of an appraised property with ease …from the mandatory information, we are required to give. We already know FB and other internet super corporations routinely censor data about issues they don’t themselves embrace. The burden of FB or any lender’s compliance should be a high one, given the social ramifications of redlining. I don’t know. Sometimes it’s better for everyone if it’s not all mixed up in excess. As long as the terms are fair and you’re dealing with fellow citizens with equal application of the law… There are no easy answers but dang, someone is finally suing facebook. Good news. I tried to re read the article but stupid ad block denial. I’ll catch it somewhere else as it develops.